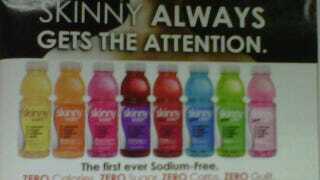 After unveiling their latest advertisement claiming "Skinny Always Gets The Attention," Skinny Water has decided to pull the campaign because —drum roll please— someone wrote in and told them they should. I'm writing to let you know that I'm really turned off by this ad campaign. I'm a current Vitamin Water Zero drinker and am always trying new beverages, yours being the next logical alternative. Thanks to this campaign, I won't. We are only interested in selling zero calorie ,better for you beverages. I agree with your position and we will pull this ad and anything like it in the future. I hope you will give Skinny water a try. Of course, it's unlikely that Erin Bradley's email to SkinnyWater was the sole reason the company decided to pull the ad, but it's definitely a fine example of one person speaking up and possibly actually making a difference.